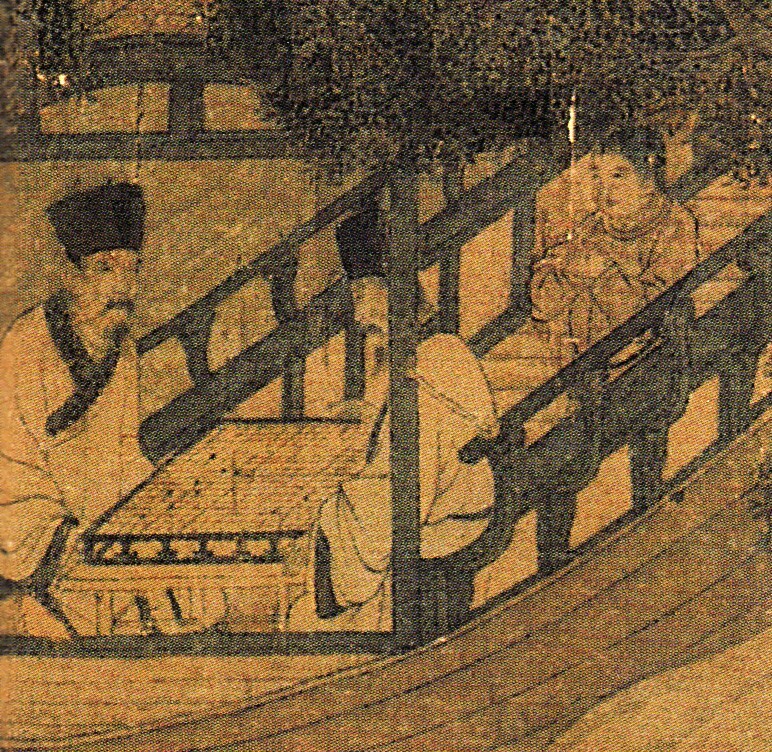 For several years I have been collecting information relating to the early history of Chinese board games, which I have now decided to publish as a series of non-narrative posts over the next few weeks. I am starting with the game of Go (Chinese wéiqí 圍棋), which is perhaps not so interesting as it has already been done many times before (for example, see such sites as 中國圍棋史話, 古代围棋图片 and 围棋考古). 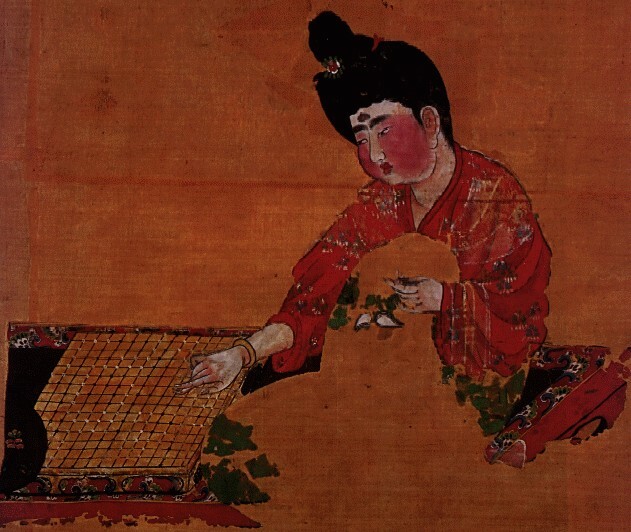 This page covers excavated Go boards and Go stones, as well as depictions of Go players, from the earliest times up until the end of the Yuan dynasty (i.e. up to 1368), and I will update it whenever I get any new information or better pictures. More pictures of old Go stones may be found at 中国古代围棋子演变简史 and 见证中国古代体育的围棋子. There are a few points that are perhaps worth making. Firstly, there is no archaeological evidence for the existence of Go prior to the Han dynasty (206 BCE – 220 CE). Han and Warring States period (476–221 BCE) tombs regularly contain Liubo 六博 boards and/or Liubo game pieces, but, despite the fact that Go stones should be more easily preserved than Liubo game equipment, no Go boards nor any certain examples of Go stones have ever been excavated from a pre-Han tomb, and only two or three examples of Han dynasty Go boards are known. And whilst there are scores of Han and pre-Han pictures and funerary figurines of Liubo players, there are no known depictions of Go playing until after the end of the Han dynasty. 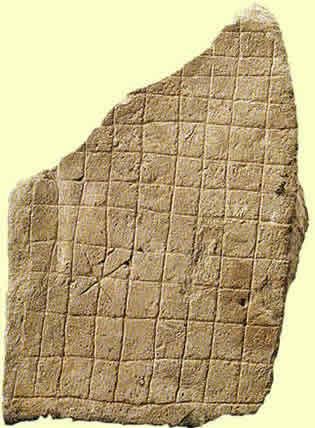 Despite this, many writers and web sites appear to show evidence that Go has been played in China for centuries or even millenia before the Han dynasty, for example pointing out examples of pre-Han pictures of Go playing or criss-cross images of Go boards on neolithic pots. 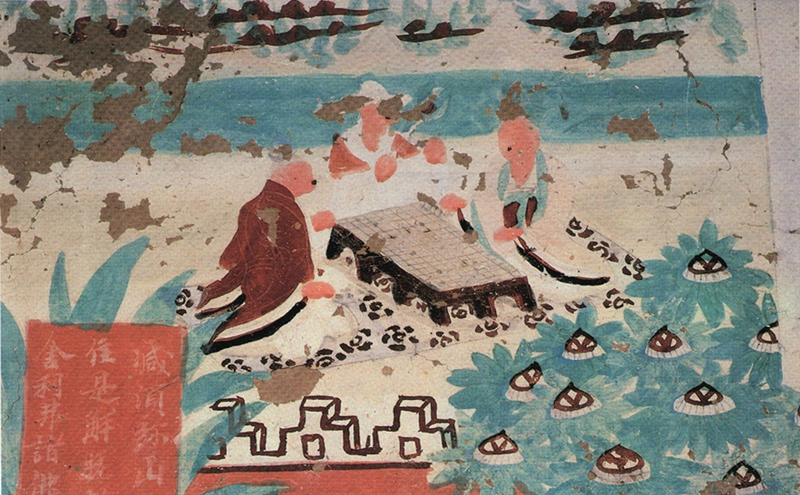 But on closer inspection many of the supposed early pictures of people playing Go turn out to be depictions of people playing Liubo. And to my mind the criss-cross patterns on neolithic pots are simply decorative criss-cross patterns. 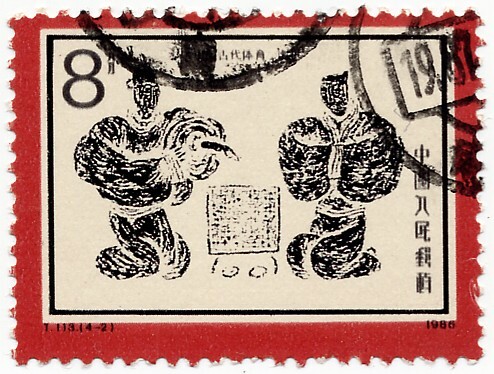 I have been unable to ascertain whether this and the other three images are based on actual Han dynasty stone or brick pictures or whether they are modern designs that are are merely in the style of Han stone pictures, but as I have never yet seen a Han dynasty picture of Go players I suspect that the design of the Go stamp must be a modern fantasy. 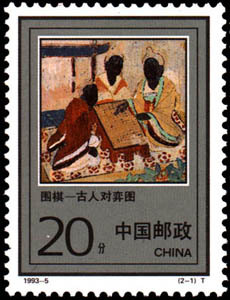 There is also a 1993 Chinese stamp with a design showing ancient Go players, but this one is very similar to the picture of Go players in the Five Dynasties period mural from Yulin Cave 32 (shown further down this page), and so if it is not based on the Yulin Cave picture it must be based on some other mural from that period. 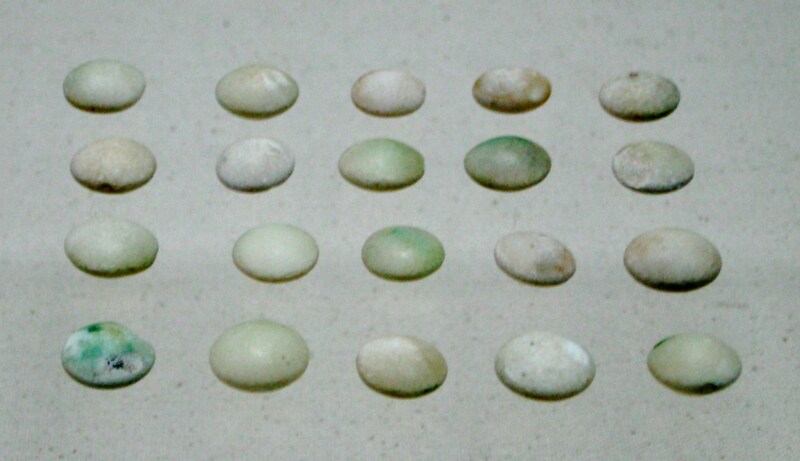 It is also tempting to see any unexplained small stones or beads that are found in tombs as examples of Go stones, but I would say that unless they are clearly divided into two colours and are approximately the right number for playing Go, or else are associated with a Go board or the decomposed remains of a Go board, then such finds should not automatically be assumed to be Go stones. 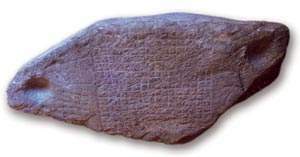 On this basis I have excluded from this page a number of finds of "Go stones" that I do not believe are really Go stones. 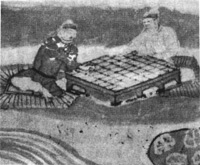 Secondly, from the Tang through Yuan dynasties (618–1386) a surprisingly large number of excavated Go boards and paintings of Go players come from the peripheral regions of China or beyond China (Korea, Tibet, Xinjiang, and the territories of the Khitan, Tangut and Jurchen states), and relatively few examples have been found in tombs from central China, which at the very least shows that the game of Go was poular across a large geographic area and amongst many different nationalities. On the other hand the two earliest known boards both come from central China, and predate any boards from beyond China by half a millenium, and so I think that there is no reason to doubt that Go was invented in China. Thirdly, the grid size of Go boards varies considerably. 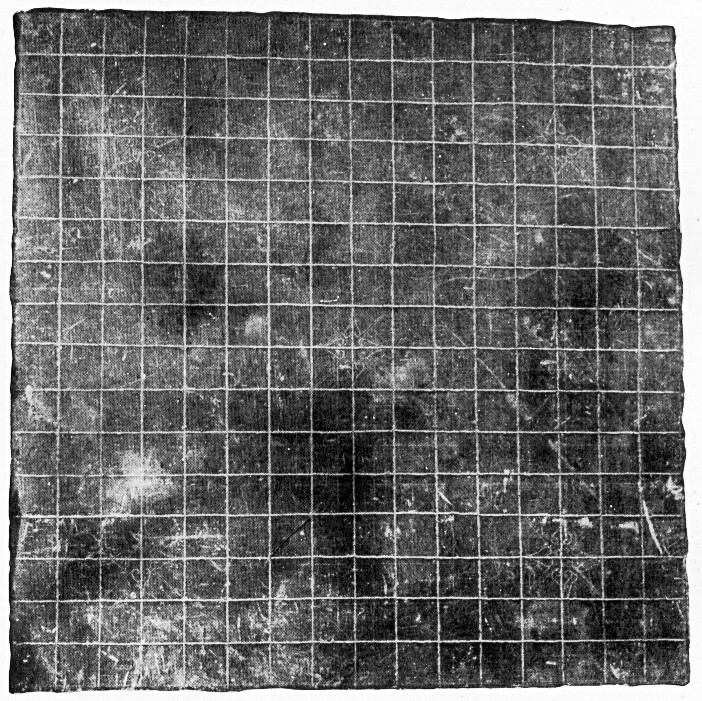 It has long been known that Go was originally played on a 17×17 grid (with 289 stones), and only developed to the now-standard 19×19 grid (with 361 stones) at later date. But not only do we find 17×17 and 19×19 boards, but we also find 13×13 and 15×15 boards, as well as very odd sizes such as 14×14 and 9×12. However, some of the boards found in tombs are miniature-sized model boards (only about 10cm. across) that have been specially made for use as funerary items, and so may not accurately reflect the grid size used on real boards. 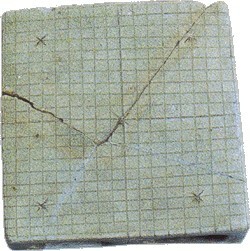 Description : Fragment of a board engraved with a grid of horizontal and vertical lines resembling a Go board. I have not yet had access to an authoritative descrition of the object, and sources differ as to whether the board is made from laquered wood or from stone (it does not look like laquer, but if it was stone then the whole board should have survived). This board was found in the tomb of Liu He 劉賀 (died 59 BCE), a short-reigning Emperor of the Han dynasty who was deposed and exiled after just 27 days on the throne in 74 BCE. He was exiled to Haihun in modern Jiangxi, and given the title of Marquis of Haihun 海昏侯. His well-preserved tomb was discovered at Xinjian district of Nanchang in Jiangxi in 2011, and has proved to be the most important archaeological discovery in China during the first two decades of the 21st century. Note 1 : This board has been identified by Chinese archaeologists as a fragment of a Go board, but I am not totally convinced this is necessarily the case. 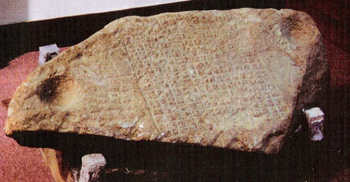 The surviving fragment does not have any star points marked, and there do not appear to be a large number of accompanying black and white stones, either of which would provide definitive evidence that it was a Go board. Of course, the lack of star points and Go stones do not prove that it was not a Go board, but it does open up the possibility that it was something else. One alternative suggestion put forward by Wang Jinzhong 王金中 is that the board is an early form of calculating board (suànbǎn 算板) on which beads were moved in order to make calculations. 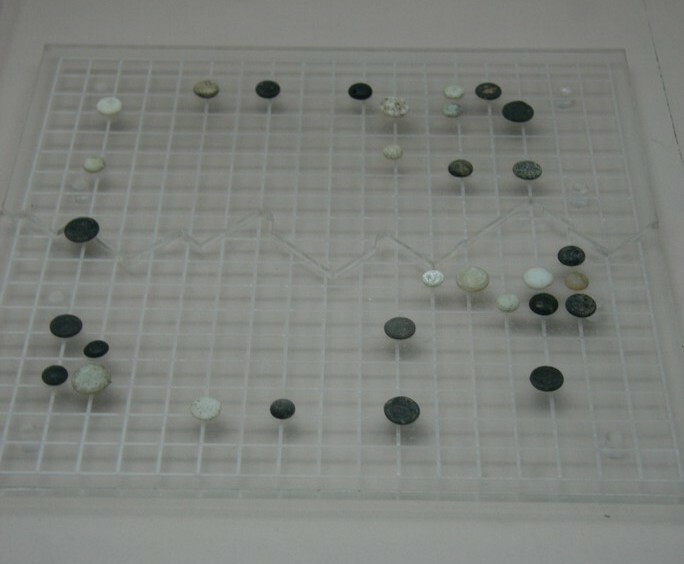 If this theory is true, then maybe the game of Go was devised during the Han dynasty by officials placing beads on a calculating board like this. 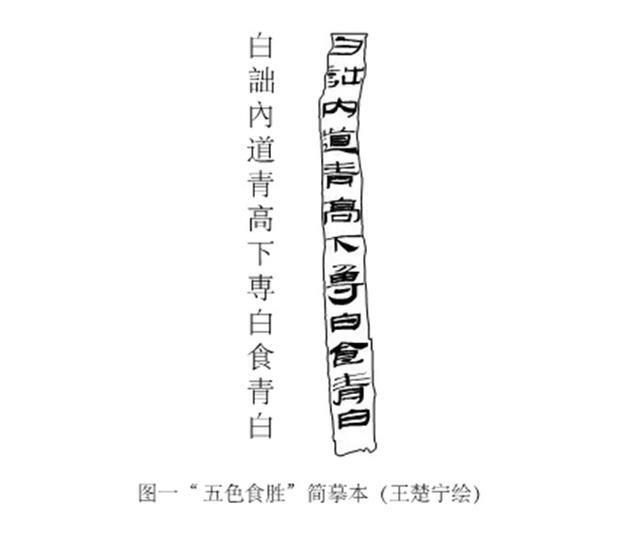 Note 2 : A text written on bamboo slips, entitled Five Colours Eating and Victory (wǔsè shíshèng 五色食勝) was also discovered in the tomb of the Marquis of Haihun. This text was originally believed to relate to divination with five kinds of food corresponding to the five elements, but more recently it has been interpreted as a manual for the board game of Liubo (see 《五色食勝》或揭開六博棋面紗). 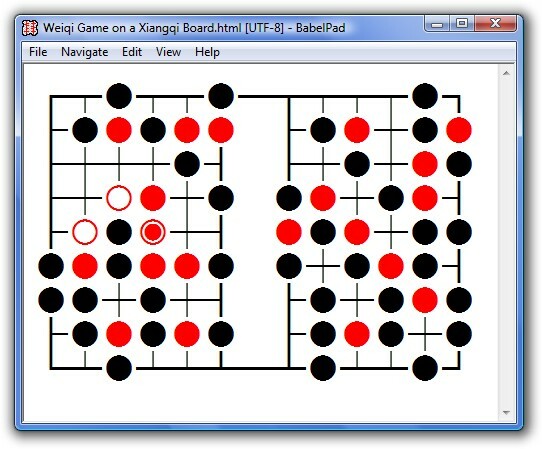 Although the title mentions five colours, apparently the text only mentions "black" (qīng 青) and "white" (bái 白), suposedly referring to Liubo game pieces. 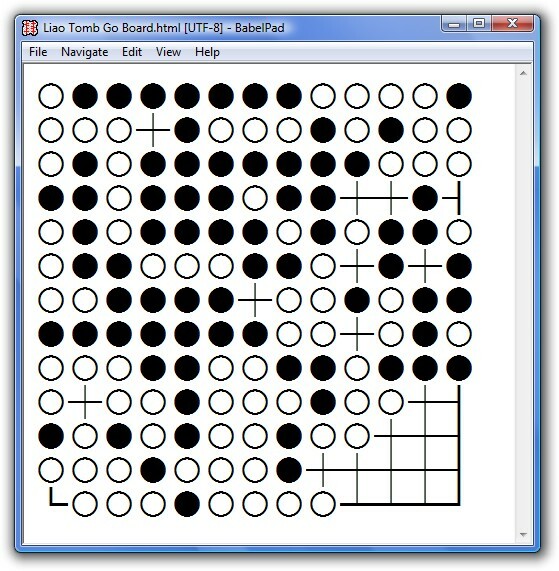 This theory seems very speculative, and I have not seen an edition of the text yet so I do not know what the exact details of the text, but if the board discovered in this tomb is a Go board then perhaps this text discusses the game of Go rather than Liubo. Date : Western Han, 59 BCE. Size : 20.0 × 6.0 cm at the widest points. Grid : Uncertain (fragment covers 13×4 lines). No star points are visible. 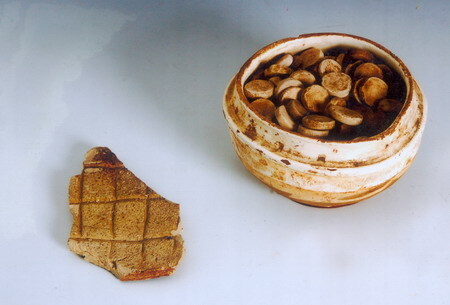 Description : Fragment of a crude pottery Go board excavated during the 1990s from the site of the southern gate to the mausoleum of Emperor Jing Di 景帝 (reigned 156–141) and his consort at Yangling 陽陵 near Xianyang in Shaanxi province. 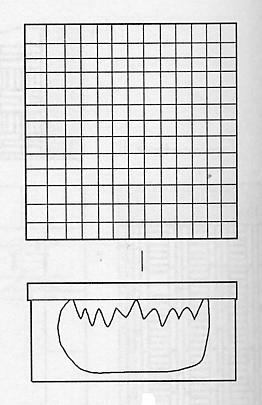 Apparently this is not a purpose-made Go board, but a tile onto which a Go grid has been scratched (reportedly on both sides, but I have only seen pictures of the one side). Because of its crudeness, it has been suggested that it was used by guards at the mausoleum gate. Date : Uncertain, as it is not associated with the main burial, but assumed to date to the Western Han period (206 BCE – 25 CE). Size : 28.5 × 19.7 cm at the widest points. Grid : Uncertain (fragment covers 13×10 lines). A star point is marked on the lower left corner, but no other star points are visible. 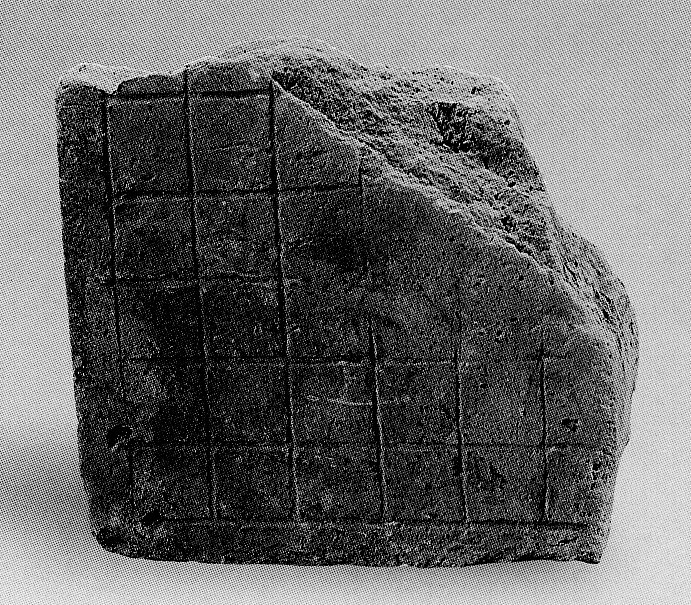 Description : Stone Go board excavated in 1952 from the Han dynasty tomb M1 at Wangdu 望都 in Hebei province. Date : Late Eastern Han period (25–220). Size : 69 × 69 cm. Grid : 17×17, with the five primary star points marked. Description : A set of stone Go stones excavated in 1974 from the tomb of Liu Bao (died 301) near Zoucheng 鄒城 in Shandong province. Date : Western Jin (265–317), 2nd year of the Yongkang 永康 era (301). Stones : 232 or 289 (according to different sources) natural pebbles, half black half white, in a cylindrical pottery bowl, 12.4 cm in diameter and 9.0 cm in height. Description : Left side panel of an illustrated stone monument depicting the life of Buddha that was commisioned by Zhou Rongzu 周榮祖. Date : Northern Qi (550–577). Description : White ceramic Go board found near Anyang 安陽 in Henan province. Date : Early Sui dynasty (581–618). Size : 10.2 × 10.2 cm. Grid : 19×19, with the five primary star points marked. 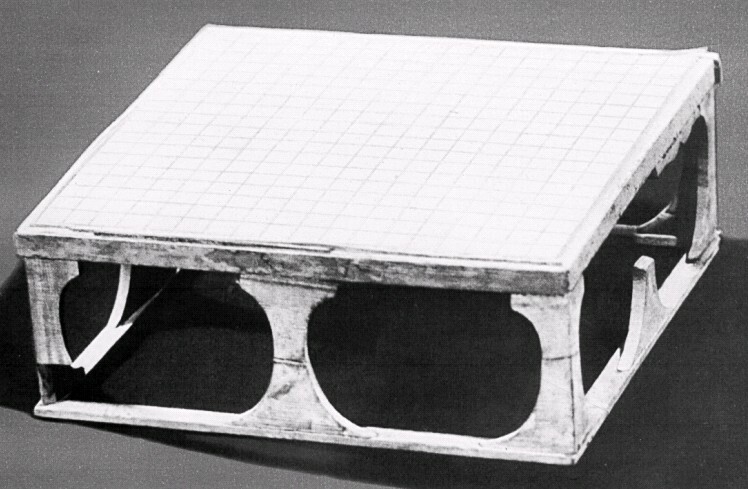 Description : Model Go board excavated from the tomb of Ran Rencai 冉仁才 at Wanzhou district 萬州區 in Chongqing. Date : Tang dynasty (618–907) : 654. Size : 11.0 × 11.0 cm. 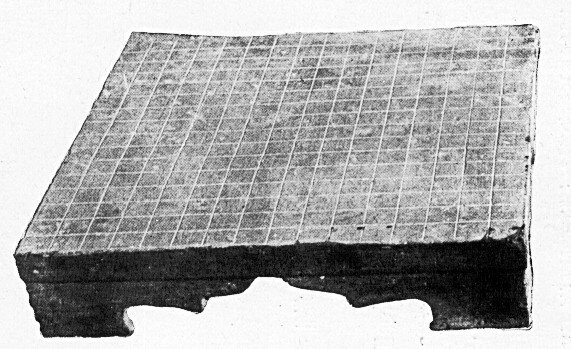 Description : Wooden Go board excavated in 1973 from the tomb of Zhang Xiong 張雄 (died 633) and his wife (died 688) (M206) at Astana 阿斯塔那 in Xinjiang (see Wen Wu 文物 1975.7). Date : Tang dynasty (618–907) : 688. Description : Wooden model Go board with painted stones, found by Aurel Stein during excavations in January 1915 in an elaborate, two-chambered tomb (Tomb vii. 2) at Astana in Xinjiang (see Innermost Asia vol. 3 pp. 662–663, 704). Date : Tang dynasty (618–907). Size : 11.5 × 12.0 cm. 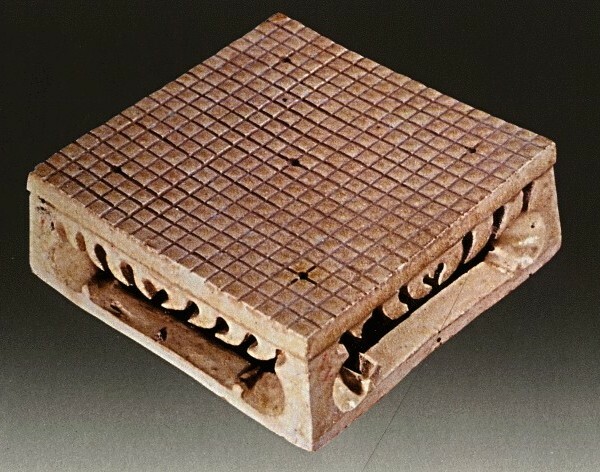 Description : Pottery model Go board excavated in 1994 from tomb M4 at Yueyang 岳陽 in Hunan province. 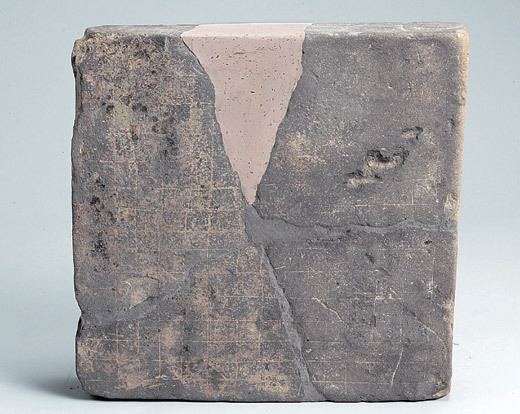 Description : Pottery model Go board excavated in 1971 from a tomb at Xiangyin 湘陰 in Hunan province. Size : 8.0 × 8.0 cm. 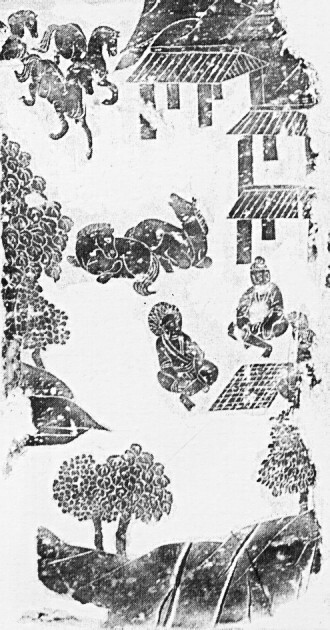 Description : Portion of a silk screen excavated from the tomb of Zhang Lichen 張禮臣 (M187) at Astana 阿斯塔那 in Xinjiang. 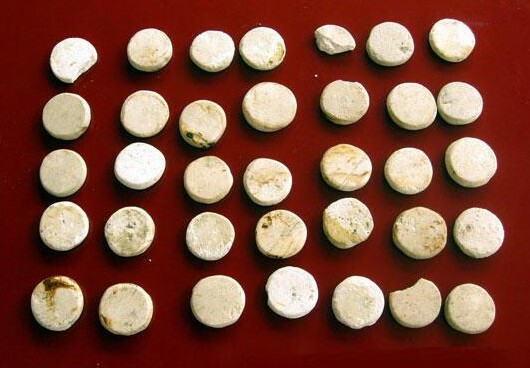 Description : Stone Go stones excavated from the outskirts of Xi'an in Shaanxi province. Stones : 20 white stones. Description : Brick Go board found in 2006 at the Bunhwangsa Temple in Gyeongju (the capital of the Silla kingdom) in Gyeongsangbuk-do province, South Korea. The board broke into three pieces on discovery, and one piece is missing. Date : Unified Silla period (668–935). Size : 43 × 42 cm. 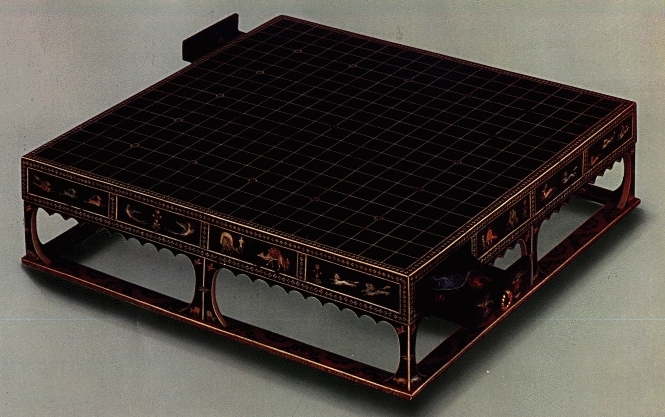 Description : Lacquered wooden Go board preserved at the Imperial Storehouse (Shōsōin 正倉院) at Nara in Japan. Date : Believed to have been imported from Chang'an in China during the Tang dynasty (618–907). Description : Crude stone Go board found in 2000 during the renovation of a house near the ruins of the Byams pa mi 'gyur gling བྱམས་པ་མི་འགྱུར་གླིང palace, the reputed birthplace of King Songtsän Gampo (617?–649), at rGya ma རྒྱ་མ in Maizhokunggar county in Tibet (see Guntram Hazod's The Royal Residence Pho Brang Byams Pa Mi 'Gyur Gling and the story of Srong bTsan sGam Po's Birth in rGya Ma in Tibet, past and present (proceedings of the Ninth Seminar of the International Association for Tibetan Studies, Leiden 2000) (Leiden, 2002) pages 27–47). The stone was resting against the wall of the house, but is presumed to come from the palace, as that was the source of building material for the house. Note : In 1909 A. H. Francke found some stone slabs on which were carved chessboard-like grids at the ruins of an ancient castle at Chini in the upper Sutlej Valley in India (see Antiquities of Indian Tibet vol.1 page 12). He presumed that these were used for playing Tibetan Go (mig mang མིག་མང), but unfortunately he did not take any photographs or make any rubbings of the stones, so we camnnot be sure. Nevertheless, these two finds do suggest that Go-playing may have been an important feature of aristocratic life in early Tibet. Date : Uncertain, but Guntram Hazod suggests that "the stone slab might have come from a very old stratum or even the foundation period" (i.e. the period of King Songtsän Gampo). Size : 144 × 56 cm. (including a 10 cm wide hollow at each end to hold the Go stones). Description : Mural from Yulin Cave 32 (in Guazhou 瓜州 county Gansu) illustrating the Vimalakirti Sutra 維摩詰經 (see Wenwu Cankao Ziliao 文物參考資料 1956.10). Date : Five Dynasties period (907–979). 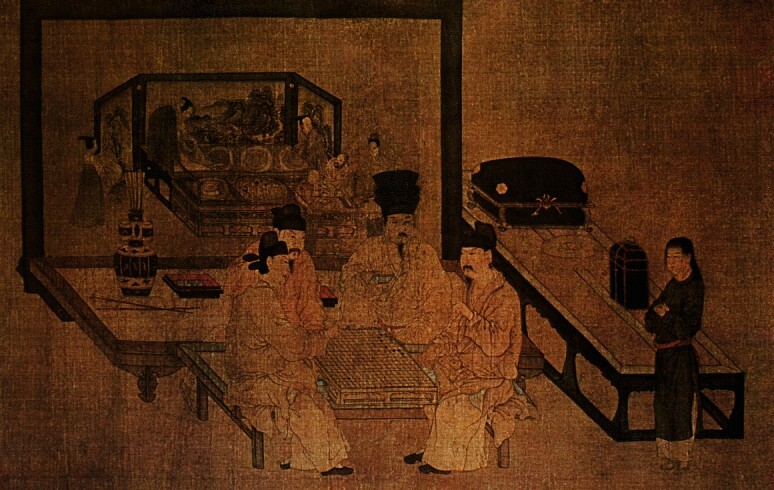 Description : Song dynasty reproduction of a painting of Go players on a screen by Zhou Wenju 周文矩. Description : Wooden Go board and set of Go stones excavated in 1976 from a tomb at Aohanqi 敖漢旗 in Inner Mongolia (see Kaogu 考古 1978.2). 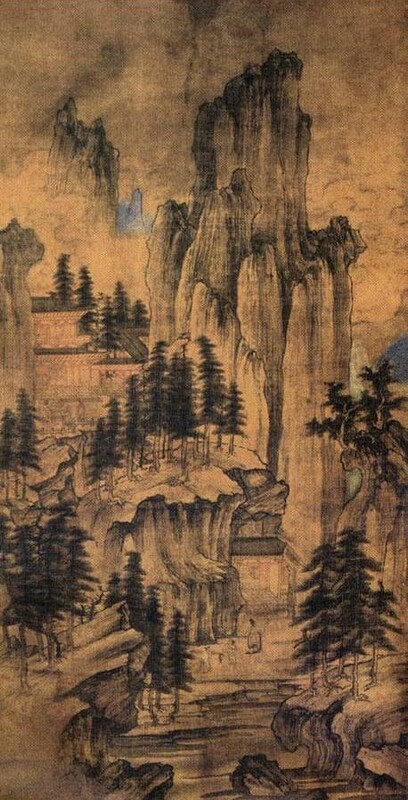 Date : Liao dynasty (907–1125). Size : 40 × 40 cm. Stones : 79 black and 76 white stones; 14 short of the expected 169 stones (Board Layout). Description : Wooden Go board and set of Go stones excavated in 1984 from the tomb of Xiao Xiaozhong 蕭孝忠 near Jinxi 錦西 in Liaoning province. Stones : 75 black and white pottery stones (presumably for use with a 13×13 board). Description : Set of Go stones excavated in 1979 from a tomb at Lingyuan 凌源 in Liaoling province (see Liaohai Wenwu Xuekan 遼海文物學刊 1994.1). Stones : 82 black and white stones (presumably for use with a 13×13 board). Description : Set of Go stones excavated in 1966 (or 1968?) from a tomb at Chaoyang 朝陽 in Liaoning province. Stones : 186 black agate and 186 white agate stones. Description : Part of a mural in the tomb of Zhang Wenzao 張文藻 (d.1093) (M7) at Xuanhua 宣化 in Hebei province (see Wen Wu 文物 1996.9). Date : Liao dynasty (907–1125) : 1093. Description : Silk painting from a Liao dynasty tomb at Faku 法庫 in Liaoning province. It shows a group of three people playing go. 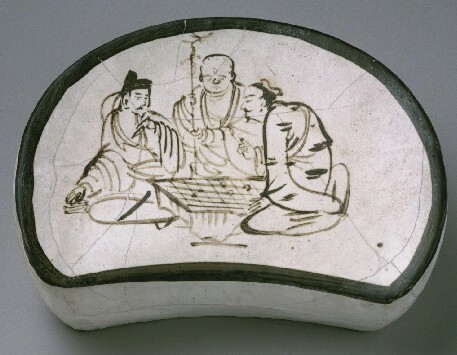 The motif of two go players and an observer derives from the story of a woodcutter who happens upon two immortals playing go deep in the mountains; the man is engrossed in the game, and when it is over and he goes back home hundreds of years have passed. 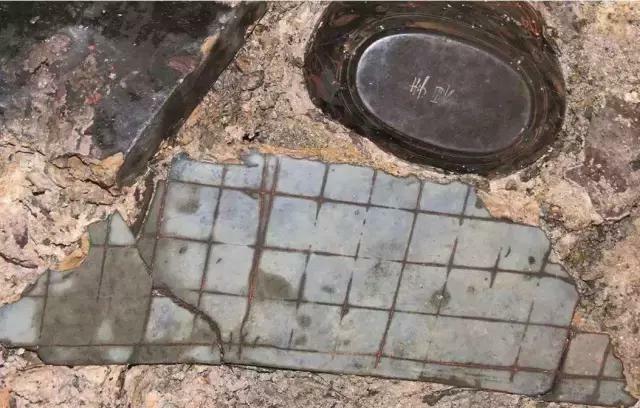 Description : Three fragments (largest shown above) of brick Go boards discovered in the ruins of the Baisigou Square Pagoda, Helan County, Ningxia. One fragment is a corner with six grid lines in each direction; one fragment is unfinished, with no vertical grid lines on the right side. Date : Western Xia (1038–1227). Size : A) 21.3 × 22.0 × 7.0 cm; B) 18.0 × 10.0 × 5.0 cm. 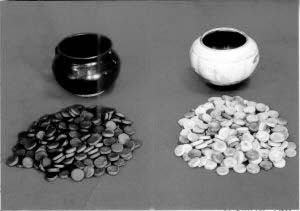 Description : Fragment of a pottery Go board, and a set of black and white ceramic Go stones in black and white ceramic bowls, These are in a private collection, and their source is unknown, although it can be reasonably surmised that they could only have come from a robbed tomb. 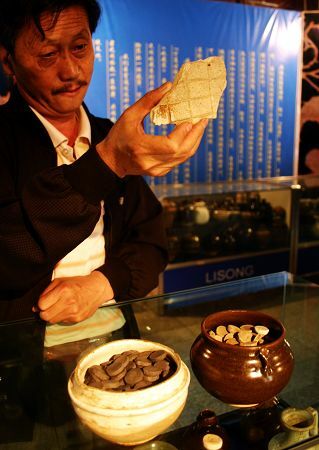 A number of similar ceramic Go stones were discovered between 1983 and 1986 at the site of the Lingwu kiln 靈武窯 in Ningxia province. Date : Supposedly Western Xia (1038–1227), but with no archaeological context this cannot be verified. 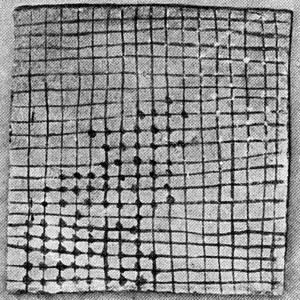 Grid : Uncertain, probably 19×19 from the number of stones. Stones : Reportedly 200 black stones and 200 white stones, but not certain whether this is an approximate or an exact count. Description : Part of a mural in a tomb dated 1189 (M4) at Ganquan 甘泉 in Shaanxi province (see Wen Wu 文物 2009.7). 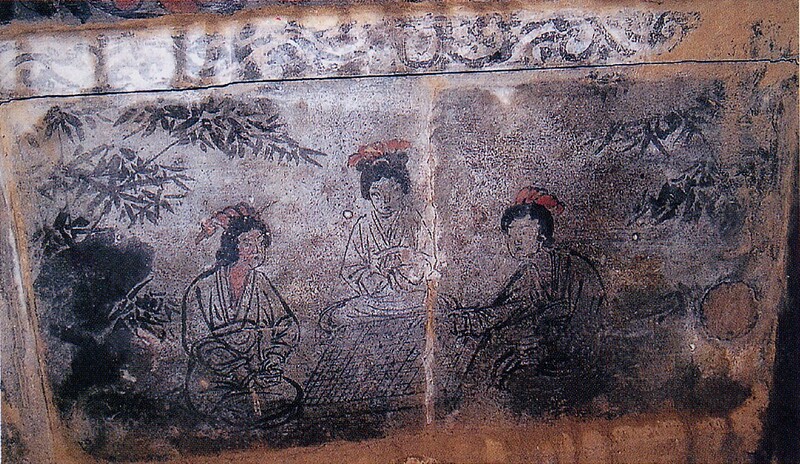 This is one of a set of four murals representing the four scholarly arts (琴棋書畫), all featuring female figures. Date : Jin dynasty (1115–1234) : 1189. Description : Go stones excavated from the site of the first Jin dynasty capital (Shangjing 上京) at Acheng 阿城 in Heilongjiang province. Date : Jin dynasty (1115–1234). Stones : 18 black and 14 white Go stones of various sizes. Description : Cizhou ware stone pillow from the Jin dynasty. Date : Jin dynasty (1115–1234) : 1178. 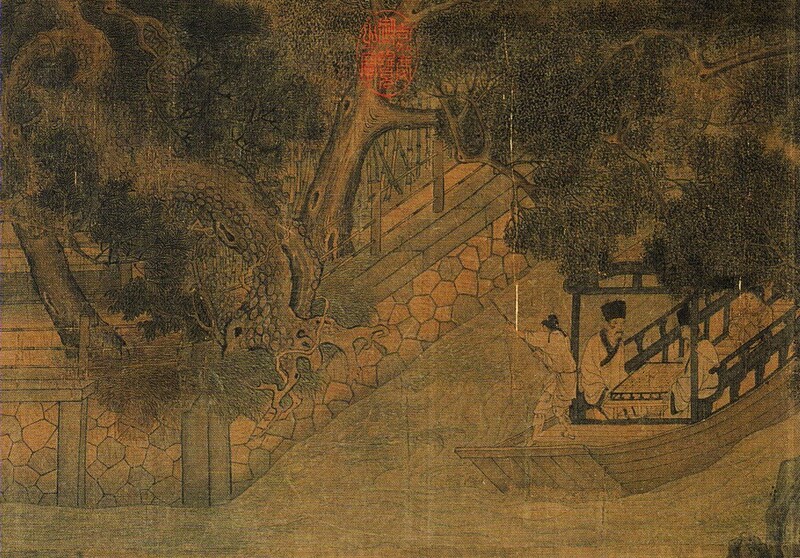 Description : Handscroll in the Palace Museum Beijing that depicts a gathering in Luoyang during the Huichang period (specifically the year 845), including two men playing Go on a boat. Date : Southern Song (1127–1279). 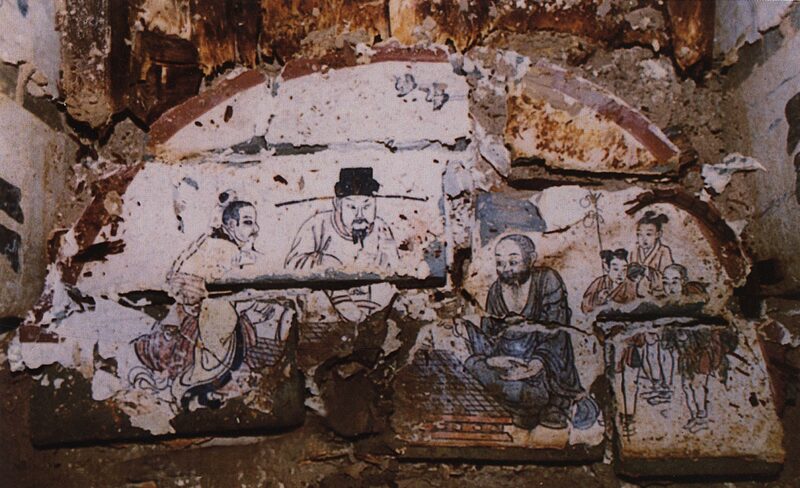 Description : Detail of a mural in Dunhuang Cave 454 illustrating the Vimalakirti Sutra 維摩詰經. Date : Early Northern Song (960–1035). Description : White Go stones discovered in 2009 in an ancient well at a construction site in Chengdu city in Sichuan province. Date : Northern Song (960–1127). Stones : About 30 white stones. 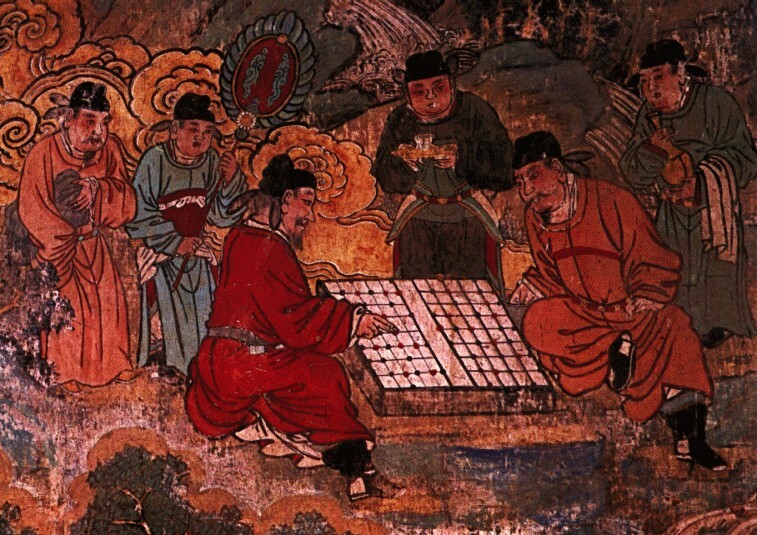 Description : Detail of a mural at the Lower Guangsheng Temple 廣勝寺 in Hongdong 洪洞 county of Shanxi province (see Playing Go on a Chinese Chess Board). 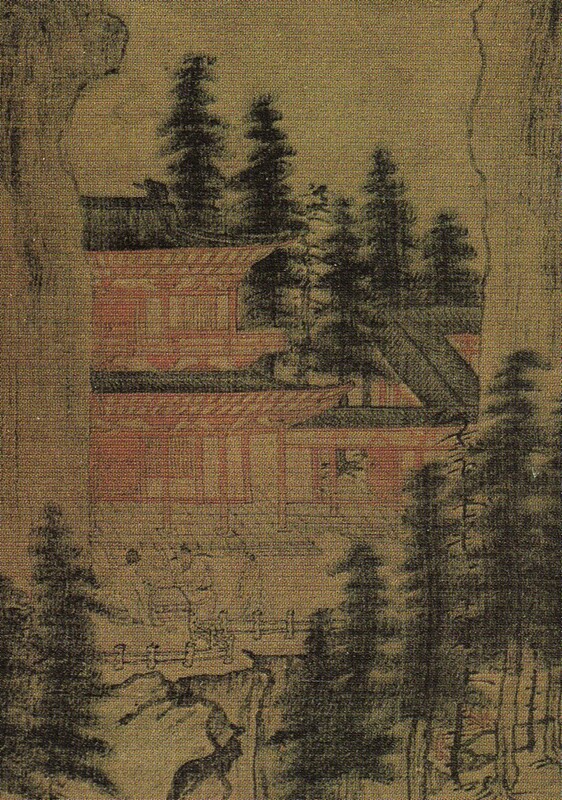 Date : Yuan dynasty (1271–1368) : circa 1319–1324. 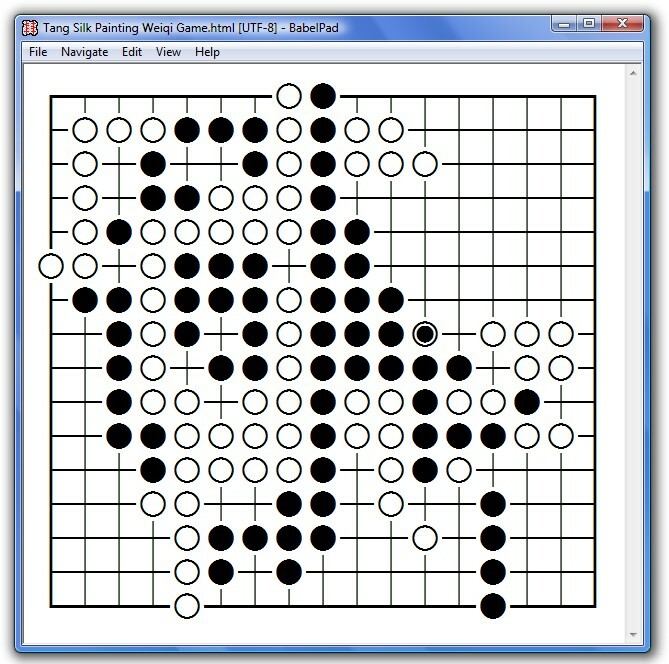 Grid : 9×12, apparently the board being used for playing Go is a non-standard Chinese Chess board (Board Layout).